Can I Make a Living with My Quilting? A lot of people wonder whether or not they can make a living at a machine quilting business. I'm not a fortune teller – I can't really determine whether or not you've got what it takes to succeed in a machine quilting business. Only you can make a business successful. In this article, I've answered a couple of reader's questions about the viability of a machine quilting business and also some business basics. Since I was 12, I have wanted to make a living from home. I have been sewing for about 40 years, quilting for about 3 years, and people seem to really like my quilts. My question is: Will I be able to replace the income from my job, with a quilting business? It seems to me, that I would need to do more than make one quilt at a time and sell them in order to make $1,000 per week, which is what I will need to be making before I can quit my job. What other things could I do that would generate more income? Your question is a tough one. Since I'm not familiar with the quilting market in your area, or what types of quilts you make, I would have a tough time gauging whether you would be able to make $1,000 a week or not. What you could do at this time is some market research to determine the what type of quilting market you live in. For example, how much do the types of quilts you make sell for in your area? 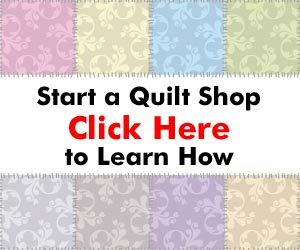 Do you have something different to offer that would allow you to sell your quilts at a premium price over other quilts? Is there a lot of competition? What about demand? Once you have a feel for the market, you can then figure out how much you need to charge in order to make your quilting pay. How long does it take you to complete one of your quilts? What are your material costs? What would you like to make for an hourly wage? All of these questions need to be answered before you can determine if you will make money, let alone replace your current wages. There are some pricing articles on www.QultingBusiness.com that may help you with your calculations. I know there is some work to do, but if you are truly interested in making your quilting pay, then it is well worth the effort. I am interested in starting my own quilting business. I have just recently lost my full-time job. I do have a Professinal Quilters Long-arm machine and have been doing some quilting for family and friends. However, I do not have a Master Card or Visa Card, I do have a check card. Is it possible to do this with a check card? Thank you and I will be looking forward to your reply. Having just a check card will not stop you from starting a machine quilting business – it just means that you will need to be a lot more conscious of your budget (since you cannot carry a balance). In your case, since you have a quilting machine, you have the single biggest expense already covered. What you would need to do next is to go through the process of making your business official. To do this, you would need to register your business and make sure you have all of the local requirements settled before opening. These requirements include, but are not limited to, insurance, getting a bank account, registering with your local government (town or county depending on where you are), and getting customers. This may sound overwhelming, but there is a lot of good information about starting and running a small business available at the US Small Business Administration's web site at www.SBA.gov. There, you will find some great information that will help you decide how you want to run your business (or even if you are ready to make that step). PLEASE NOTE: I am not an attorney, so I am not giving any kind of legal advice here. You should always consult with an attorney when dealing with any kinds of legal matters. Thanks for a very relevant article. I’m in exactly the position that you’re talking about. I have purchased a long-arm quilter, and that’s as far as I’m able to go!!! So I’ll be following any comments really closely. it is difficult to really think about these issues and to be able to separate doing what you love and running an actual quilting business. excellent food for thought!